Wrong. It WAS $600. It’s $300 at the moment because it’s just bad optics to be gouging the public, especially for a life-saving product that only recently went for under $50. The happy, wholesome face of crony capitalism: Heather Bresch, exceedingly well-connected (daughter of Democratic U.S. 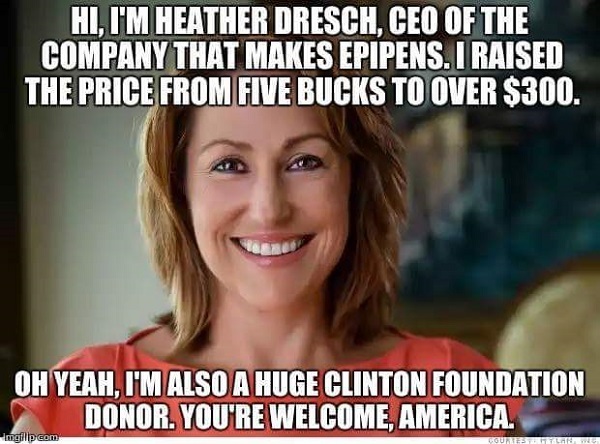 Senator and generous Clinton Foundation donor Joseph Manchin) CEO of Big Pharm Mylan that, with a little help from their DC friends, made the EpiPen the only game in town…for the time being…until people got mad at paying $600 for one dose of epinephrine. Being a Clintonista, Ms. Bresch’s company is practically praised for moving its operations abroad to avoid high corporate taxes. Were she anything but a Dem crony, the media’s verdict would be somewhat less kind. In this Barron’s puff piece, she is equally lauded for protecting us all from those nasty, untested generic drugs…that just might also pose competition for her EpiPen. Who are we to question the motives of such public-spirited members of the corporate world…if they’re Democrats?